Introducing the Bapron! aka the “baby apron”. I hope the name doesn’t turn you off (I know it’s hopelessly cheesy), but this bib is really cool! It provides a ton of coverage in the front, much like an adult apron, and ties in back with bias tape! It’s easy to make-I can whip one out in less than 1/2 hour (I’ve made a dozen or so, so I’m getting pretty quick! ), even with making the bias tape myself. Here’s the back view with the cute ties! love! Would you like to make one (or a dozen) of these for your own cutie, or for gifts? Buy the printable, PDF pattern here! Buy a License to Sell Baprons you make personally, here. A HUGE thank you to Melissa from Melly Sews, for digitizing and grading the pattern for me. boy do I love these. Super great. I am pretty sure I am gonna have to make some of these. I paid for this pattern but… I have all the pictures now but all the instructions are blacked out. What did I do wrong and how do I get the instructions. The title page printed with the necessary words. The third page told me how long for the bias tape (I believe) The pattern itself came out fine. Ready to sew. I guess this is a lesson learned. No response, no pattern and no nothing. I was really looking forward to making these for my granddaughter. Sorry, you didn’t give me much time to respond however…email is really better to get ahold of me. I am happy to send you the pattern if you would forward your paypal receipt to [email protected] thanks. Hi – You were extremely patient and kind when responding to the comment about “thanks for nothing.” It’s so nice to see people who can be that patient and kind to others who are criticizing them. Have a great day 🙂 The baprons look so nice and very practical. Plan to make some soon to give our new grandchild arriving in August (2018) Thanks for sharing your nice projects. thank you! I get it a lot and it does get old, but oh well! Happy sewing! I bought this also and received no pattern or response. What a rude comment to the designer! Mistakes happen. Give her a break! In your impatience, you didn’t even give her time to respond to solve your problem! Take a breath before you cut someone off at the knees. It’s a great pattern. i LOVE LOVE LOVE this 🙂 My baby girl just started eating ‘solid’ foods, and I’m all about a bib that’ll stay on! Thanks! Your next project should be a bib with sleeves. A kid I babysit had one and it was awesome! Oh man, I love this!!! Thanks for the tutorial, and I can’t get over those cheeks she is sooo cute! This is seriously awesome. I love it! I love it !! Is this clothes, can I add this to the roster for my KCWC stuff? hehe. I love it! I’m kind of afraid to make it, my friends might maul me to try get me to sell them some. Maybe I’ll make it and hide it like it’s illegal. ILLEGALLY CUTE. Riiight?! love this jess! my aunt gave me a similar apron/bib that we just love, and it’s really similar to this. They’re so nice to wash up and use and of course they stay on the kiddos, hugely important!!! YES! I’m jumping out of my seat with enjoyment! I have been thinking about making some bibs for my baby (who really isn’t much of a baby anymore). She has two bibs and they’re both the wipe-able kind but the velcro on one is already shot and the other one folds up in her face because it’s all plastic-y and longer than she is. Would you venture a guess as to how big of a kid this would fit? K is 14 months and 22 lbs. Ok….confession time. I am one of those lurking blog readers who LOVES everything you do. Can you even imagine how wonderful you are for sharing your talent with us. I can’t thank you enough. I now am blessed with two adorable Grandbabies ( I never knew my heart could be THIS full of joy) and I will be making one for each of them. So I will end this gushing note and get myself off to the my stash and sewing machine!!!! The shoulder straps are genius! Charlotte is the cutest!! This is exactly what I need. Time to get to work on it! Both of my girls know how to yank velcro off. WHHAAAAAT?!?!?! I LOVE it!!! Seriously! SOOOOO cool Jess! WELL DONE!!! I gotta make a bunch of these! You kill me with those cheeks every time. I don’t have kiddos but we are always entertaining and people bring theirs along–I think I am going to make a few to have on hand! We’re in the middle of packing up and moving, but my machine and fabric are still out, so I’m heading downstairs NOW to whip up one for each of my littles! Um…she is the cutest lil thing ever! These are great, and I’m excited to try them out, but those cheeks on Charlotte are even better. how cute. i wish i would have had something like this when my daughter was a baby. those tiny bibs did nothing. I need to make some of these for my 18 month old. She’s figured out how to take her velcro bibs off and only wears them about half the meal. I could not download the pattern and Explorer keeps shutting down when I attempt it. I really want to give this a try!! these look very awesome! I linked to this on my blog. Thanks for all the inspiration! This is freaking awesome, Jess. My youngest hasn’t worn a bib in about 6 months. I completely gave up and have just been stain-sticking the heck out of her cloths. I think she might leave this one on. Thanks! charlotte is SO cute! and I love the bapron. ingenious! Way cute! Thanks, this isn’t too girly, and since I am having a boy, this will work great! I think I might try this with plastic on the front of it. Hummm, this is just a great idea! Thanks again! this is amazing! i can’t wait to try it! and what a cute picture of Charlotte! IN LOVE!!! Thank you so much! I love it! I will definitely be making a few for my darling granddaughter, Saydee!!!! (great name, right?). Charlotte is adorable, as always! Bapron=AMAZING! Genius really. I’m adding these to my to-do list. I’m pretty sure I add something from you at least once a week! Thanks for all the awesomeness! WOW! These are so cool, I’m blown away how cool idea this is. Thank you so much for the tutorial! In love! Once again Jess…you are AMAZING. Wow! I love this! Thanks for figuring it out for all of us. And that last picture of your sweet baby is so precious. What a cutie! This is sooo sweet. I will definitely put this on my list to do. i love it..! and thank you so much for the pattern..! and printable link, really helpful…! Well aren’t you just brilliant. I wish you had posted this a few months ago before the youngest went all anti-bib on me. The funny thing is I have a photo of me wearing a bib like this a very, very long time ago and I always thought if I could only get a bib like that. funny thing is I totally couldn’t figure out what the back looked like from the photo and I figured it was a totally crazy contraption. Thanks for sharing. I am making a few for friends. Maybe even Cenzo will let me put one on him. Especially since he discovered spaghetti with tomato sauce. 1. Sweet baby Charlotte is A-dorable. 2. This bib is awesome. I will be needing loads of these soon, so thankyou for the tutorial. Ok, so I love this, and was going to make one, but I don’t have facebook, and am not big on joining a bunch of stuff. Is there any other way to get the pattern? cute bib, but I want to know about those pattern weights! They look amazing… tell me more! I tried hunting them down on your blog, but I couldn’t find your blog’s search feature and they weren’t listed in the tutorial section. Please tell me more!!! Thanks for the great pattern and tutorial! My cousin is having a baby in the fall and these would be great baby shower gifts! I just made your bib and it is AWESOME! And that’s using store bought very narrow bias tape. I taking pictures now and will put up on my blog soon! I love this! It would make such a great baby present. I love it!!! I have a friend with a brand new baby (and another friend with a baby on the way). I have a feeling I’ll be making tons of these!! LOVE LOVE LOVE this! I can’t wait to make some-lots! Thank you so much for sharing! This would make a great art smock for older kiddos too! THANK YOU! Visiting from Ucreate today! This is absolutely fabulous! This is going on my “Must Sew” list! (somewhere near the top – my little one has just started solids!) Thank you so much for the tute! I just saw this on Pinterest. Thanks for sharing. I will have to try to make a few of these. I came hear from U-create. This tutorial is amazing. I need to make some baby gifts and this is the perfect project. Thanks for sharing it!!! I just made this tonight, but the pattern printed way smaller than what it should have, with a header and footer. My baby is 5 months old so I still think it will work – we will see how it fits when she wakes up. The pattern is easy to follow and the final product is SO CUTE! Please make sure to double check the size before you cut your fabric. These are so cute!! I know a couple of people having babies soon – might have to whip up a couple of these! This is a great idea! ThANK-YOU so much for sharing. BTW, Your baby is absolutely gorgeous!!! What is the best way to get 100% of the pattern..just copy as is and enlarge at a copy center (at 100%)….there doesn’t seem to be a select size on the pattern….sorry for so many questions:)…love the bib!!! Charlotte looks soooo cuuuute!!! love that picture in the end of her – adorable!! Great idea with the bib, thanks for making it. These are so cute. Can’t wait to make some. Thanks for the tute. We just had to share this with our readers! omg,,these are so stinking cute and look so easy to make. With two grandbabys on the way I will definitely be making a few of these. thank you for sharing.. and Charlotte is just adorable. That is super cute and I LOVE the name! I’m a sucker for combo names like this. My husband and I are always trying to make them and crack up when we can’t make it work. Thanks tons, I’ll be linking. You ‘re one lovely baby girl, you know! just found your website today from craft gossip and i love it. so many great ideas. not a member of facebook so i can’t download from scribed. how big are the pattern pieces so that i can print them out to the correct size? Oh wow, this is so cute! I was needing a nice homemade gift for a very soon baby shower for a friend… this is it. My only issue is my fear of bias tape. I can never manage to catch both sides… But, I will be brave and attempt this for the sake of a good friend! Thank you! A truly useful baby gift! This is wonderful! Thanks so much for the pattern and tutorial! Thanks for the pattern. Love these. I have two new grandchildren born this year so I will be making lots of these bibs. LOVE it! I will have to link from my creative blog http://www.apronsandapples.blgogspot.com Just became a follower! THANK YOU! I have 4 kids so tons of laundry and this would help for 2 of them! It’s cute thing! I linked your tutorial on our blog http://www.craftreport.blogspot.com . Thanks! This is exactly what Mrs Baby and I need. You’re awesome! I’ll definitely be knocking a few of these up this weekend. I LOVE these. I am all set to make a few for my lovely nephew Jack no! The bapron looks great!!! And Charlotte’s makes me go awwwwwwwwww….. so adorable…. Thanks so much for this pattern. This is just the cutest and that sweet baby! Ever more cute. ♥ Can’t wait to make one. Thank you for sharing. I made my 19 month old one and now I need to make like 100 more. I gave you a shout out on my blog. The Bapron is perfect!!! I must make a handful for my messy girl too 🙂 Thank you SO much! This is EXACTLY what I need! My 11 month old rips off all bibs except the small cotton teething bibs and those just do not have the coverage for avocado and banana. I can’t wait to make a dozen! Adorable! And functional! Such a fabulous tutorial and just perfect for my messy Tess! Thanks. My mom gave me some of these to use that she had from when I was a kid. They’re awesome!! BTW, there’s someone on etsy selling baprons and she is using the picture of your sweet baby. The Bapron is great and I know i will be making them for every baby I know (since i don’t have any). BUT I have to say that your baby is ABSOLUTELY BEAUTIFUL! Wow! This is a great bib! I can’t wait to make this for myself and friends. Thanks! OMG! I am so tickled! I made one and added the pic to the flicker pool! LOVE IT! This is AWESOME! There is just soooo many cute Japanese designs out there, it’s ridiculous! I have been tinkering with the idea of a baby apron for some time now and I’m so glad I found you. I’m gonna make some for my wee one!!! Thanks so much for the tutorial! Here is a link to my post with pics of the bapron I made! And if it’s upsized a bit it’s a great craft apron for older kids. Love the covered shoulders! I love this bib! Wonderful! I posted a link on my blog to your tutorial. I also have some pictures on there of some that I made. Thanks for this tutorial. I made my first bapron this weekend. It came together like a dream. I made one change, I used terry cloth instead of flannel (I cut up an old hand towel). While it’s definitely a little thicker, it’s also more absorbent which is a must for my sloppy little eater/drinker. Is there a way to get the download without signing up with that place? I’d really REALLY love to make a bunch of these but I don’t want to sign up to the site. Please help! : ) Thanks so much! Oh! Your baby is adorable!!! ps – your little one is gorgeous!!!! thanks for the tutorial, my little girl (who is also a redhead with blue eyes – and guess what – her name is coincidently also charlotte (it just is the best name!) will soon be able to sit and then she’s definitely gonna need one. So thank you very much, its my favourite tutorial when it comes to baprons! Hi…..thanks for this fab pattern but unfortunately I dont want to log in to FAcebook to download it. Is there some other way please? Could you email me the pattern? Sorry. Why is Scribd suddenly asking me to pay to print the patterns? Thank you so much for this! I can’t make to make one (or 12, and boy does she need them!) for my daughter – fantastic idea! I tried to print this pattern and Scribd says it’s archived so they are charging to use it. Sad. I hope my eyeballed version of your bapron turns out as cute. WOW! 110 comments congrats! (now 111).I just wanted to say I found your blog through Pinterest, that featured a picture of the Bapron, on the cutest baby! I repined, wanted more info and happily reached your tutorial, which is wonderful, because I have every intention of making several of these by the time my newborn Grand Daughter “Charlotte” starts on solid food. I thought my Daughter had picked a name for our Charlotte that was hardly ever used today. But I am so amazed at all the beautiful Charlotte’s I have come across since she was born 3 mth’s ago. Your baby Charlotte is so beautiful …. you can see our Charly on my blog. I love your blog … and I will return often. Love your blog- keep up the good work! 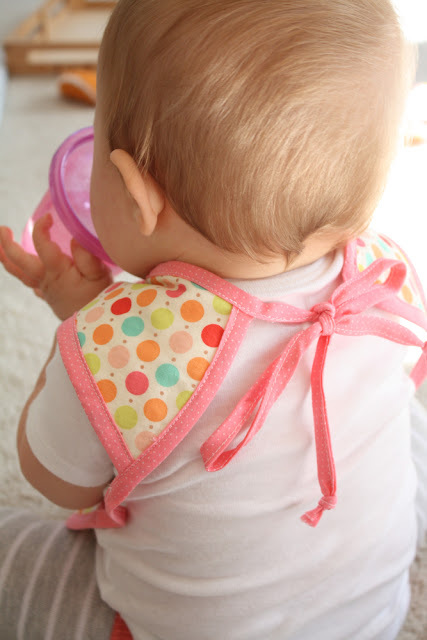 Such a fun, easy bib! Can’t wait to make another. Wow Jess…these are adorable! I gave it a shot and love them. I even altered the pattern to make a variety of sizes. Hi! I’ve made a bunch of these in laminated cotton for my daughter, but I’m thinking about making some as party favors for some babies. 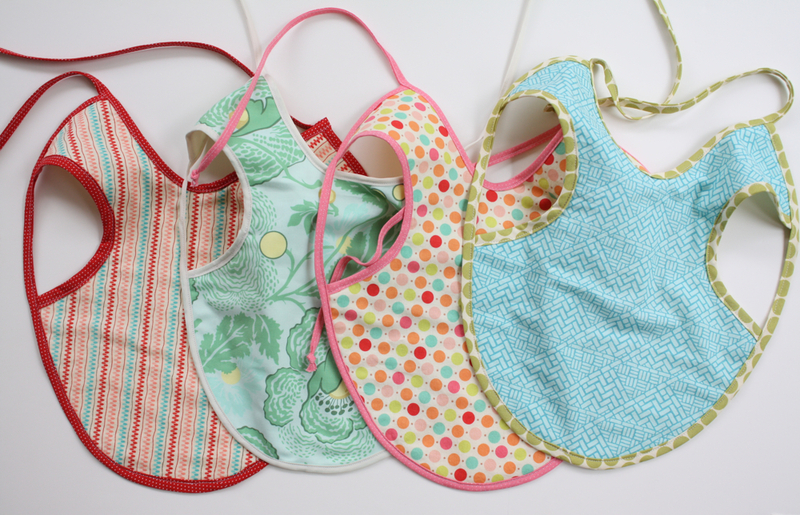 Did you find the fabric + flannel combo worked well for bibs? I’m thinking I might try either fabric + flannel or fabric + terry, just wondering how “clean” it will be. Thanks! I cannot wait till the kids go to bed! I know what I will be doing tonight. These are awesome!I have a bolt of terry cloth, so I am going to use that on the back. Thanks for the free pattern! This is so cute, I cannot wait to make one for my DGD, who continually pulls off her velcro-fastened CHEAPO bibs! Over the past few weeks I have made 5 of these, for all the first birthdays of my mum & baby friends. I customised them based on the character and style of each little one, including applique ties and bowties for the boys, and button, patchwork, ribbon, flowers and hearts for the girls. Such a lovely pattern – thank you for sharing! I’ve linked back to your post. I work in the nursery at a daycare and we are always spending $$ on the Velcro bibs! Only for the babies to pull them off and mess up clothes!! I’m going to try to make one/some for the babies!!! Génial ! Thanks for the tute. I am so making this for my almost 8 months old baby! Wonderful! Thank you so much for sharing. oh, and btw, Charlotte is super cute! My daughter sent this link and we are totally addicted! I cut out seven Baprons last night and can’t wait to get to the bias tape making. Thank you, thank you, thank you. You’re a genius. Thank you so much for this pattern and instructions! I love it!! We are having our first G-baby in Dec. a girl and I will be making some of these! Brilliant! I will be making several of these for myself and for my friends! I love this! I made one for my niece in girlish prints and now I’m about to make a “lobster bapron” for my son as we are headed to New England and will be eating lobster. It will be a lot nicer than those plastic ones the adults will have to wear! Thanks so much for this tut! Love it! My grandaugjter Charlotte is four…a big girl that doesn’t need a bib…but we will have a grandson in December perfect! Thanks! Great post! I’ve added this link to both of my websites. Here’s the lobster bib I made with your pattern. Thanks!! Such a great idea! I would probably change a few things though… easy cleanup by making it out of laminated cotton… then you could add one of the “catch” pockets to the bottom to catch all the food that tends to slide all the way down. 🙂 Thanks so much for sharing! I’m always looking for cute baby shower gifts, I can’t wait to use this! I have a couple coming up, so guess what they’ll be getting 🙂 Thanks for sharing the tute! This is so cute. I am going to add a pocket on the front to catch all the big spills. Thanks. Just made one this morning! Thanks for the pictorial. You give excellent directions. Going to give it as a shower gift this week. Have been meaning to make one of these for ages and would really like to now that school started up again and my baby is 5 months old. I can’t download the pattern though, unless I upload a pattern or pay. Any chance you could email it to british.mom(at)gmail(dot)com ? Thanks! LOVE THIS! My daughter sent me a link to your blog on Tuesday because my grandson is going through lots of clothes since his bibs don’t always cover enough. I have a bias tape maker so it was super-easy! Made 12 bibs last night out of stuff I had on hand – can’t wait to surprise my daughter. Thanks for sharing! Hi Jess! I made one!!! thanks for such a great tutorial!! I really like the dotty fabric that you used for your bias tape. Do you remember where you got it from? Awesome tutorial, thank you! I never felt inspired to just make a bib, I mean you’ll get like 1000 different designs in stores and they hardly cost you anything. I just didn’t feel I could contribute on the bib level, till I saw this tutorial! I can’t believe no company contacted you to get them produced on large scale :). I’m going to post a picture of mine on the Flickr group now! Great tutorial! I love your girls, they’re so cute!! I have a pattern for a mega bib on my blog. I don’t like using bias tape, so mine doesn’t use it. It also has snaps to make a catch all scoop on the bottom. I was wondering if I used print flannel if it could be reversable? Or if I used a print flannel would it be necessary to use fabric also? I love this tutorial and have loved making these baprons. I blogged about my latest attempts at http://7craftymamas.blogspot.com/2011/10/bapronim-obsessed.html. Thanks for such a great tutorial!!! What a cute little model, isn’t she beautiful !! That bib look very practical, I just have to find a baby to wear it !? Thank you to share. I love your pattern and would like to make your pattern. I think it’s a great idea. But you have to jump through hoops to do it. It says it’s a free pattern but when you pull it up, it makes you download a program and you have to subscribe to the service before you can print anything. It cost $9 a month. Don’t say your pattern is free, if it obviously isn’t. I have been needing this tutorial! I can’t wait to whip a few of these up for my anti-bib daughter, because really, I am so sick of soaking all her stained clothes in OxyClean! Thanks so much! Thanks for this tutorial. I did one bapron, I love it ! That looks great. I will make these for my 6 month old baby. Wow, I ‘ll be making this for sure! Too cute! I think this is another pattern that will be going on my “go to” list for baby gifts. I have nephews galore, and a preggy workmate, so I can see plenty of these coming along. I plan to put PUL on the back, and maybe bamboo velour on the front. Thanks so much for sharing this! I made one for my daughter’s first bday bib and added an applique #1 and butterfly. It was so cute – feel free to check out our photos on Facebook. I just got my FIRST sewing machine, and while looking for a first project on Pinterest, stumbled across this tutorial! Now I know what to make with that ADORABLE piece of Pirate-print fabric I just found! I don’t even know anyone with a baby boy, but I am sure I will someday soon! Thanks so much for sharing this, and making it look so easy! OMG This is incredibly awesome! I saw it on Sew Mama Sew Handmade Holidays. I have a 18mo and # 3 on the way and fully intend to whip up a bunch of these. And what a great baby shower gift, too! Just saw this on One Pretty Thing. Love this because it covers more of their clothes! My baby is spitting up like crazy and I think this would protect his clothes from getting all wet more than a normal bib would. I don’t have any babies to sew for, but the bib is just too cute! Your baby girl is adorable! Is there anyway to purchase one? I have just made 2 of these – they are just the cutest! I will blog about them later today! I adore this pattern! Thank you for sharing! I made an adorable one for my cousin’s little girl! I found the armholes on mine seemed much smaller than the picture in the tutorial. I’m pretty sure I measured and all the rest correctly. Next time I’ll probably cut an extra couple inches on that piece (the 31 inch bias tape). I couldn’t leave a comment and not mention that your ‘model’ is just the cutest!!! I have a sixteen month old and a preemie in the NICU, girl and boy! I have been looking for a project I can actually accomplish and love, and this is fabulous! Thank you for such a great tutorial!! I paired this with Calico’s Diaper Strap for a great shower gift! What a cute pattern! Thank for sharing! Thank you so much for sharing this bapron pattern with us. I’m expecting my first grandbaby (girl) any day. I’m sure I will be making a few or more. That little angel of girl of yours is just so gorgeous. Thanks again and have a Happy 2012. I made one! No – I didn’t. I made TWO! The first I followed the pattern size and for the second, I added about an inch to the size all the way around… (he’s a growing boy!). Question – is there a tip for the binding? Mine kept bunching up on me? Thank you for this Tutorial and Pattern. I made two so far and have more fabric to make more 🙂 I used laminate cotton so that it can just be wiped clean and I added a pocket along the bottom! My sister in law loves it. Lindo! Eu amei o babador! Obrigada por disponibilizar o tutorial! Farei um para meu bebê! Charlotte é muito linda! I saw some great adjustable aprons at at children’s museum. The same idea might work on these. On the tops of the shoulders you would need to make a small sleeve, just large enough to fit the bias through (like the type you put the curtain rod through on a curtain). The arm hole bias would slip through the sleeve at the shoulder and tie around the neck as usual. I know “sleeve” isn’t the correct term, but hopefully you understand. This might make it fit different sized children. Can’t wait to make this. Great tutorial! Great tutorial! Thanks for the pattern, too! Our great-nephew will be getting some of these soon! I bought a sewing machine just so I could make these! My daughter won’t be able to rip the bib off anymore! I saw this on Pinterest and just had to say what a great idea! I’m looking forward to making a few! I just made two this morning, it was fun. I love this pattern and made 3 of them for a friends first grandson. She sent a picture via iphone of him in one but I could tell it wasn’t tied and looked snug at the top. He is only 6 months old and I guess he is just a big baby. 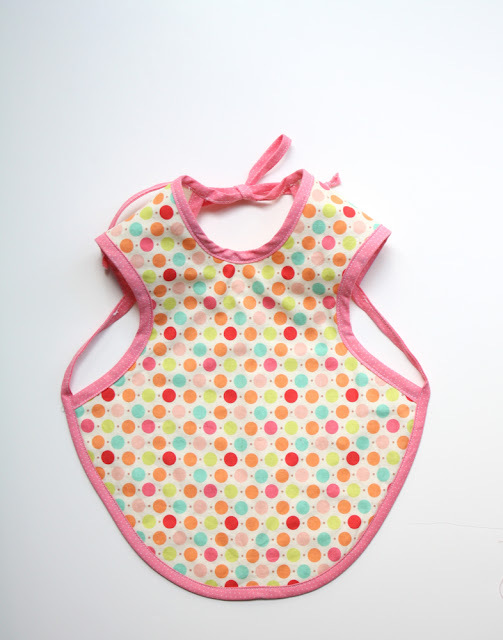 Have you tried to make this bib larger?? And how did it turn out? I would love to make more but am afraid that I am making them for a very short time span. @Camille-I haven’t enlarged it yet, but it would probably work well…just add more to the fold and curve the bottom a little larger. Good luck! Hi, I was unable to download the PDF pattern. Can you send it to me? Ugh, I had problems accessing the pattern file as well. Can you send? [email protected] Thanks so much for sharing. I absolutely LOVE this bib!! It was so easy to make and the pattern is great. Thanks. This pattern is great. Made it with a waterproof material for cloth diapers because I have a teether that drools nonstop. This is so cute, so practical, and perfect for any little sweet-heart. Thanks for sharing!!! wow i wish i knew how to sew cause i’d be all over this! LOVE this! Thanks for sharing. it’s so cute, I will make one for my kids. I just started learning how to sew and this is a great first project! After a bit of trial and error, ripping some seams out here and there, I made one! The bias tape was too small for me to wrap around the fabrics, so I ironed it flat then folded it in half and used a zigzag stitch near the edge – LOVE how it looks but we’ll see how it holds up in the wash. I’ll try and post some pics soon. This is a great project! I love that it can be made from a fat quarter too! Gonna have to make a bunch for a few baby showers coming up this spring! Too cute! I added a pocket, used PUL fabric… and presto!!!! the perfect Bapron!!! So I’m a new mom, a full time student, I work, and besides not having time, I don’t actually know how to sew; and the sewing machine we have is broken. But I’m highly interested in these. I think they’re fabulous. I’d be happy to pay someone to make a few for my daughter. [email protected] Email if interested! Thank you! Love the Bapron! My little girl is wearing the one I just finished making minutes ago . . . I made it reversible with a layer of flannel in the middle, but realized that I am not great with bias tape and it’s hard to get both sides looking perfect. I am definitely making more, and some for shower gifts! Thanks for sharing. Just sent out a box of eight bibs made from your pattern for a group called Love Without Boundaries. Had a great time experimenting with different widths of bias tape and used up some fabric that has been in my stash for an embarrassingly long time. Love the simple, practical design and am going to add your bapron to my list of go to things to make for baby shower gifts. Thanks for the terrific tutorial. I can’t seem to print the pattern for this wonderful bapron. Could you help me get the pattern? What a wonderful idea for baby gifts. Thanks so much for sharing this idea! Thanks a lot for your tutorial. I have made 2 for my baby, and the pictures are in my blog. I linked your tutorial in my post. Sorry for not writing blog in English. I love that bay. he is really cute. its a easy tutorial to make such a things for little babies. Thank you so much for this amazing tutorial. Last night I made 4 of these baprons. They were the first things I have ever cut and sewn together! I was so happy! They came out beautiful! I cannot wait for my daughter to be born to put them on her. Thanks a million! Could you send me the pattern via email? I can’t get the file to open. Thanks so much, waiting to make one. Like this project,the first one with red shade is my favorite. This is adorable. Definitely making some of these for the new grandbaby arriving this fall. I’ve made about 12 of these from this tutorial and they are the only bib I will use! I did make one change–I added a pocket at the bottom of this to catch some of the bonus bits that otherwise find their way onto my daughter’s lap. I just fold a bit of the fabric over and iron so I have a doubled (right sides out) strip about 6″ wide and use the bottom of the bapron that I’ve cut out as a guide to cutting out the pocket. Sew it on the bottom and then finish as directed. I usually embellish the pocket with rick rack or ribbon. I have pointed so many people to this tutorial! And recently I made a slightly larger version of your pattern for my slightly larger toddler. Love this so much! Thank you! Great pattern. I used the laminated fabric with flannel backs. Also used packaged double fold bias tape and tried several different thread colors and stitches. So cute and quick. Perfect tutorial!! Thanks. Sensacional… vou fazer para meus sobrinhos. Parabéns e obrigada! Thanks for the tutorial! I’m going to make some soon but could you give me an estimate of the size? Just wanted to make sure my pattern is somewhat close! THanks! Delightful tutorial!! I’m going to try making one this very morning!! Thanks! This is sooooo cute! I pinned it and i definitely need to make a few… my 8mo daughter has figured out how to take off the velcro bibs and they don’t cover enough of her anyway. I did mine only slightly differently because I knew I couldn’t cut a straight line for the bias tape, lol. I did a french seam around the entire bapron, then used some ricrac that I had lying around for the straps/edging. i made one of this baprons tonight and although i am an absolute beginner, this piece looks really good! so thank you- this is a great tutorial (and a damn cute babygirl :). I love this very much. THink it will be very useful. I discovered the bapron when my daughter was a toddler, so my mom and I enlarged the pattern to 125% and made a bunch of “big baprons.” I had to come back to get the original size today since we’re having a boy, who needs little ones. While I’ve only made 4 or 5, I bet my mom has made over 3 dozen for me and all of her friends’ grandchildren. Thank you for sharing this pattern — we really appreciate it! I have no idea what you mean by a blogger email account, sorry I am new at this. My question is- I want to make it water proof so my daughter’s juice doesn’t soak through, what would you recommend layering it with? P.S. Email is [email protected] if you don’t mind responding. Thank you bunches! I am curious – Do you think terry cloth can be used instead of flannel? It would provide a thicker buffer to the clothes and help with clean up after. Have you ever tried it? My best friend is having baby and I am trying my hand at making these for her. 🙂 Thank you for sharing! Thankyou for such a wonderful free pattern and tutorial. I bought some gorgeous Teddy Bear material and made my brother a Teddy bear with it. I couldn’t bare (haha-pun intended) to leave the rest just sitting there, so whipped up your Bapron. I’ve posted pictures on my blog, along with a link back to you and your post. Thankyou again for such a wonderful tut. I can’t seem to access the pattern. Could I have it sent to me, please? These are so very cute and I have several baby showers coming up. I made this for a baby gift and it was a hit! I’m new to sewing and your step by step instructions and photos made it so easy for me! Thank you so very much! I just made one of these last night – here is my photo, if you’d like to see it. I love this pattern! I bought a plaid Christmas dress on clearance in January at Walmart for a dollar and I plan to use your pattern as a guide to make it into a holiday bapron. Thanks. Thanks so much for putting this out there. I just made my first Bapron. Not a sewer, just learning as I go. We’re expecting our first grand baby any day now. So happy to be able to give grandbaby something homemade from Grandma. Great tutorial. I know this is an old post, but I wanted to let you know that I made a couple of these for a baby shower. This gal had dozens and dozens AND DOZENS of gifts to open, yet EVERYONE stopped and oohed and aahed over those baprons. When it was over, my 13 yo daughter whispered in my ear “Mom, I’m so proud of our gift!” I was too. I will definitely be making these again. Thanks for the pattern! Love this idea! Had a little visitor over yesterday and no bib was sent with him. I am going to make some of these as gifts, but a couple to keep on hand for little visitors! I saw this on Pinterest and will totally be making a few of these for my daughter’s Christmas stocking (she’s a month old now) and for Christmas gifts for the other babies I know! I’ll also be subscribing to your blog 🙂 thank you so much for sharing this wonderful pattern and for making it free! Just wanted say this is a fantastic pattern! I made one yesterday, I used a type of wipe clean material and it worked great! I’m sorted for Christmas presents for all my friends’ babies. Thank-you! I am so thankful for your sharing, it is wonderful tutorial. I love these bibs and had to try one with some scraps. As i was cutting the pattern out i cut an extra peice for the bottom to make a pocket to catch the food that don’t make it in their mouth. Works great!! Give it a try. This is great! I was a nanny a lifetime ago and the family I worked for had similar bibs. When I had my own, I looked for something along the same lines, but hit dead ends. Thanks for sharing! We are a group of volunteers and opening a new scheme in our community. Your web site offered us with valuable info to work on. Youâ€™ve done a formidable job and our whole community will be thankful to you. I made mine using waterproof canvas in the back and the flannel on the front for absorption. This is the best pattern ever!!! Thank you so much for sharing!!!! Hope you don’t mind – I’ve posted a link to your blog on my facebook page – with a picture of the bapron you have inspired me to work on – a collaboration of embroidery, quilting and hexies – hope you like it! This is fantastic. Thanks so much for sharing your pattern! Love this bapron and what a great idea. I certainly had fun making them! Just for everyone’s information, I have found this particular size only just fits my 9-month old granddaughter. However, no dramas, I just re-created the pattern 10% & 15% larger, so I will see how they fit. The binding will also need lengthening. This bapron tutorial is so easy to follow and once you have all the parts at hand (making bias tape took longerthan i suspected) it takes no time at all to put together. I love this one and it’ll come handy when our wee one starts on solid foods in a months time. Think i just will have to buy the selling rights from you. I love this one! Just saw this and am excited to make some for gifts! Funny that the original is from Japan. They seem to have a lot of great ideas over there (I used to live there when I was a kid). Thank you for the pattern! Teaching myself to sew & saw this project. Very cute so I decided to make one for my sister’s baby shower. I got the bright idea to use iron on vinyl (easier to clean, you know) it made the material very stiff to work with ending up not being such a bright idea! Turned out cute in the end, definately usable. Thanks so much! Hi, I just came back to view this tutorial again but the tutorial seems to be gone and only the pattern is left. Is there something wrong here? hi, can i just ask why this tutorial has been taken down and i now have to BUY the pattern? + does this $6 INCLUDE the tutorial? I decided to sell it because of many reasons, one of them being other people selling my pattern as their own, etc. The pattern comes with the full instructions, of course, and a larger size also. hey there! i’ve tried to leave comments a couple of times with my ID signed but it doesn’t seem to work so i’ll have to leave an anonymous comment, sorry! my name is debbie and i’m about to purchase your gorgeous pattern (and hopefully make it this weekend!) but i just wanted your advice on what type of lining to use? I love this bib! Will the pattern be available again? Thank you so much for the pattern! I made these as gifts for my sister and sister-in-law who are expecting soon. The only difference is that I needed more length on the bias tapes (probably because my cutting wasn’t precise enough). And I used oil cloth. They turned out great! I get a dead link when I try to purchase the pattern and I can’t find the free version. Can someone help? here’s a link to my etsy shop where you can purchase it! https://www.etsy.com/listing/159323520/the-original-bapron-pdf-pattern? I saw your tutorial last year when my granddaughter was born. I followed it and made your Bapron, it was so easy. I’ve made 6 of these for my granddaughter. My daughter-in-law loves them. She refused to put store bought plastic bibs on her baby 🙂 Thank you so much for a great tutorial. I’m looking for the tutorial as I’ve bookmarked this page for a while waiting to make this for when I have a baby. I now have a baby (yay, finally! ), but don’t see the tutorial anymore. Is this no longer available for free? Too bad, it’s a great pattern but I can’t afford to buy it. Hi there. I just bought your pattern through the link above and the tutorial is a bunch of black and gray bars, hardly any text. Is there something wrong with my PDF? Should there be text? I’m happy to email you the pdf I get if that will make it easier for you to tell me if something has gone wrong. that happens in Mac Preview for some reason…view it in Adobe Reader for best results! Would like a hard copy of pattern, Tried to download and a Trojan virus showed up. Won’t risk the pdf again. Is it possible to get an actual pattern sent? If you purchase the pattern, you will get a link to download-absolutely no viruses involved there. No hard copies, sorry. I did purchase the apron, and I have not received anything.. I am confused..I don’t have time to keep going through these comments, I wish I could find your email. Very disappointed. You have my email, I would think by now you would have been able to email me. Hi Lucy, I don’t actually have your email, sorry about that…if you email me at [email protected] (available with the email icon on the top of my blog) with your paypal receipt I’d be happy to send it off. What happens usually is it might have gone to your spam folder..it’s easy for me to send you a new copy I just had no idea you needed one. Again, email me and we can figure this out! I love this bib and I have made several for gifts. I have posted a link to your tutorial on my blog. Thanks. Why does it say Get tutorial and FREE Pattern on previous page? Just wondering. Which page? It used to be free, now it’s for sale. Bapron is a GREAT idea!!!! I would definitely have purchased it – BUT – why is the link/picture still out there saying FREE if it is no longer free??????? This is getting lots of bad comments on different sites and creating problems for the owners of those sites recommending your product. I’m determined to get to the source before I lay blame to anyone – you seem to be the source, why is it still advertised for Free? The Bapron is well worth the $6.00 being changed for it, in my opinion – it’s a GREAT idea. But the hard feelings being caused by the “FREE” picture is detracting from that. Thank you! Look, I can’t go back and request that everyone who pinned the Bapron before it was for sale, change their pin, can I? That’s, I’m guessing where you saw this. I DO NOT advertise it for free, but again, I can’t change Pins from the past. I purchased the pattern, bought fabric and realized it is not all multi-directional. How should I cut it out? I wasn’t even thinking about that when I purchased it. HELP! I’m looking for this exact laminated cotton print! What is it? I’d love to make a bapron like this! Fabulous pattern. I’m thinking about purchasing your pattern, but would like to know if you use a batting or flannel sandwiched between the two layers of fabric … assuming you’re using two layers of fabric. I usually layer flannel with quilting cotton…just 2 layers though you could do more! If the order went through, it should send it to your paypal email account. what happen PDF pattern is was error not open chrome and can’t wait make these? Do you sell them. I know if I attempt to make it myself they will not look as good as yours. I don’t, sorry. Check Esty-I know a number of sellers do. it should let you use a credit card through paypal. The bapron looks great, could this be used for both feeding and drooling? Is there a code or something ? It says “FREE” then sends you to a link to buy. I’m confused!!! LOL!!! It is an adorable pattern. Ordered this download yesterday and am finding the fold lines and seams do not line up, nor do the circles. printed it as instructed, test square is the proper size. What am I missing? Did you cut along the grey lines? Thank you, figured it out, was my copier! I bought this pattern, but am using thick terrycloth and so the bias tape measurements are not working for me. Can anyone please tell me what the measurements are for the bias tape between the shoulder and armhole connection are one both sized finished bibs? Thank You! PayPal is not allowing my payment for the Bapron to go through. Have you had other problems with them? I’ve emailed them, but they’ll answer in about 24 hours, and I thought I’d check your end as well. Nope, haven’t had any issues from my end…hope it works out soon! I have the pictures and all but no instructions nor pattern. Below is what I found on FB and it says patter is FREE. I have no problem if you sell patterns, but why get us to come with a link that says free? Oh, come on now. You think she owns the internet and has control over what other people post? Come on now. You do know this site is called Craftiness Is Not Optional and you say you came from somewhere called StudioKat Designs? Not the same thing. Cute pattern……I ordered the pattern and then I ordered the license……I paid 6.00 for the pattern and got it….then I paid 10.00 for the license and got the pattern again but no license…..I either want the license or the 10.00 back….i went on your site that you had listed, but could not find anywhere to contact you….please let me know…. I had some cotton jersey knit that I used for this pattern, but I’m not that experienced in how it works with bias tape. Can I use regular bias tape, or do I need to make it out of a similar fabric? I just purchased this pattern. I got all the pictures and directions fine but the pattern itself will not print and I am using Adobe. Very frustrated at the moment. I too came under the pretense of free but I gladly paid the price because these are adorable. But it is a waste of money if the actual pattern will not print. Please email me directly with any questions/concerns about the pattern! fanrastic pattern! Lived making these, super cute, really well done! Thanks much! Is pattern only available with purchase? So easy to make – fantastic instructions! Totally worth the $6 – have made two easily! Thank you! I would like to buy your pattern, but when I click on the links they say, “page not found.” It looks like this is an older post. Do you have a new link? Thanks! If you click on my patterns link on the button tab up top, you will find a link to purchase it there! The image on Pinterest said this had “tutorial and free pattern.” Can’t find anything about downloading without paying the $6 though. Was just curious of what’s true. YOU LISTED THIS PATTERN AS FREE AND I’VE BEEN THROUGH YOUR PAGE SEVERAL TIMES AND AT THE END, I FIND THAT THERE IS A CHARGE FOR THIS PATTERN. RATHER UPSETTING SO PLEASE TAKE THE WORD FREE OUT OF YOUR DESCRIPTION. It used to be free, now for sale. (for a few years now) It’s not listed as free on my site, and obviously I can’t control who pinned it with what labels years ago. This post should be taken off since it’s very mis-leading. I don’t see a FREE pattern anywhere…….if you’re selling, do it somewhere else and put BUY in the title. It used to be free, now for sale. I don’t have free on my site anywhere labeling it, and obviously I can’t control who pinned it years ago. How come it says free pattern on the web site Baby coupons and stuff? On here you are charging for this pattern. Someone need to fix both sites! I have absolutely NO control over other websites. this pattern WAS free years ago, and is now for sale. It’s not that uncommon for pattern designers to do so. I do not advertise it as free on my site anywhere, and I obviously have no control over other sites so please don’t take it out on me that they don’t check their sources or that you are clicking over on an old link. Email me at [email protected] with your paypal receipt and I would be glad to send a new copy! I ordered this pattern n February 2nd and have not received it yet. I ordered this pattern on February 2nd and have not received it yet. You’ll see I’ve responded on this post many times about this…it was a free pattern for a limited time. Now it is for sale. This is not a new concept or wrong to do. When it was free, people of course pinned it as free or posted about it. Obviously I can’t police the entire internet to make sure everyone knows it’s not free anymore. So I apologize for the old info but it is NOT false advertising. No where on my site does it say that and that is all I can control. I believe some one is cheating and names the bapron Schobber and selling it. on pinterest it says free pattern??? All i see is where to buy?? It used to be free for a limited time, now it’s for sale. It’s not advertised anywhere on my site that it’s free, if you’ll notice. It used to be available for free and is posted as such on some sites and pinterest boards, but obviously I have no control over them to change that info. It’s now for sale, which is fairly common among pattern designers, to offer it for free for a time. Thank you for this super pattern. I have made several of them for my granddaughter. I did make one small change. I added a little pocket in the front to catch food that drops. Everything old is “new” again, lol. I can remember my younger brother wearing one of these at feeding times and i am 62, lol. I purchased the bib pattern but did not receive the link to download it. Could you send me the PDF? You sent a payment of $6.00 USD to Jessica Christian. You haven’t entered any instructions. Shipping and handling charges are estimated rates. Yes! Can you email me at [email protected]? What have I done wrong? My armholes are not as large as the pattern. I’ve used the measurements from the pattern. I believe I made the armholes smaller when I created the pattern for sale, it fits better around the shoulder that way. I absolutely love these bibs, made several for a baby shower and for our grandbaby. I added a pocket across the bottom. They will be used a lot. Thanks for the great pattern and easy instructions. Hi. How do I get my pattern that I paid for? Email me at [email protected] with any problems, I’d love to help. Are you still selling the Bapron pattern? ( I see comments are from 2011). When you say sizes 6mo-3T how many sizes are included or is it one size fits 6mo-3T? Does that make sense? yes it’s still for sale! in my patterns tab or etsy shop. 🙂 there are two sizes, the smaller one fits 6 mo to probably about 2 yr..and the larger size 2-3t or even up into 4/5 if they are smaller kiddos. Great Pattern, I just purchased it! Thanks so much for sharing. Bought your pattern about 2 weeks ago and have made more than a dozen since. Someone left the comment that if making your own bias binding they preferred cutting the strips no wider than 1.5 inches wide. That is my preference also. I made a few using the extra wide double fold commercial bias and took all of it out in favor of the smaller size. The wider tape just didn’t work. The single fold bias looks super dainty on the smaller bibs. This is addictive! Please do not say that the pattern is FREE when it is not. Very disappointed about being lied to. Hi, This pattern was free for a limited time when it first was released. Obviously I cannot control who pinned or posted about that after the fact but I do not myself promise anywhere that it is free anymore. I bought this pattern and all the details were blacked out. It left me guessing on how long to make the straps and ties. Look elsewhere for a pattern!! I am so disappointed. P.s. the print out isn’t due to a ‘Mac’ issue either. ? I’d be happy to send you another copy, but every time I heard about this problem it was with Mac Preview, not Adobe Reader. Please email me and I can send another copy and or help you figure it out! Wow, I’m surprised at all the negativity. I did have a slight problem but it was not the seller’s fault and I was able to download the pattern and all the great instructions. My grandson looks adorable in all his nice new bibs and his clothes remain clean after a toddler meal. Thank you Jess for your time and effort. I purchased the pattern over a week ago (5/20) and was wondering how long it takes to receive the pattern? I thought it would be a pdf download – but no. I’ve also not received anything in my email. I have, however, been charged. It is an auto email, should be sent right away. Check your spam folder and if it’s not there I will send you another copy! I bought this pattern years ago and it is my go-to gift for new parents. They all say it is by far their favorite apron, and have asked for the next size up after their children outgrow the first size. I use flannel on the front, and terry on the back for most of them, for max absorption. I have a 4 year old grandson with epilepsy. My daughter bought a bib very similar but in a larger size to fit a 4 or 5 year old at a thrift store. I was wondering if the pattern can be enlarged to fit him as he grows. 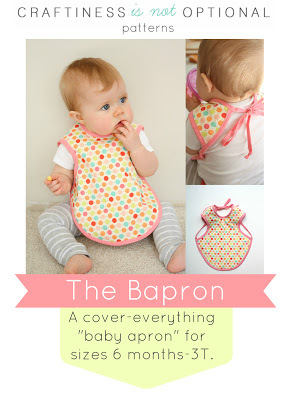 Is the bapron no longer available as a free tutorial and pattern, as it says in the “45 quick and easy sewing projects for beginners-For Creative Juice?” It is really cute and would be great for my grandson who has just started eating baby food.